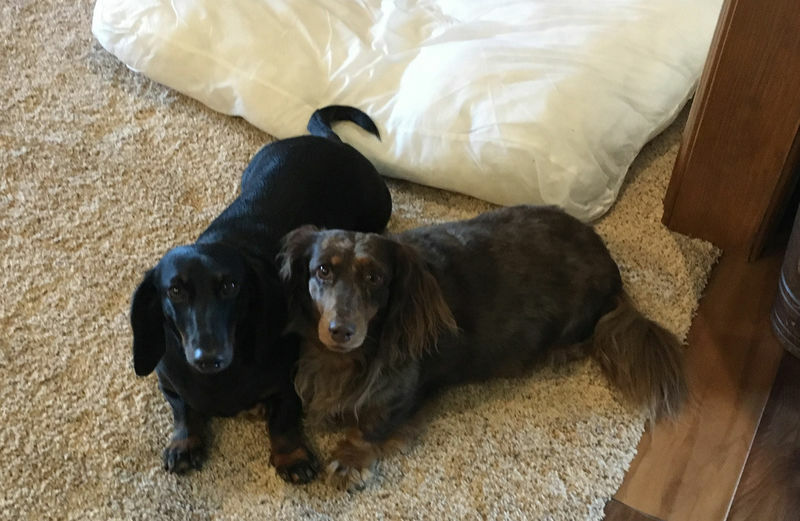 We have two dachshunds and like most dachshunds, they are food driven. We feed them twice per day, just a small scoop of food in the bowl, and keep them lean. They know when it is close to feeding time and are on high alert for me to move from my home office. I don't wear shoes in the house in the summer. I was in socks (fully clothed!) and deliberately walked quietly toward the laundry room where we feed them. Our house has a concrete floor, (slab and stem walls) so no creaking floorboards. I was on the carpet of my office floor and as I reached the edge of the doorway to go into the hall and stepped onto the wood floor that is glued to the concrete, I see a dogs head pop around the doorway of the living room. Somehow he sensed me moving quietly. 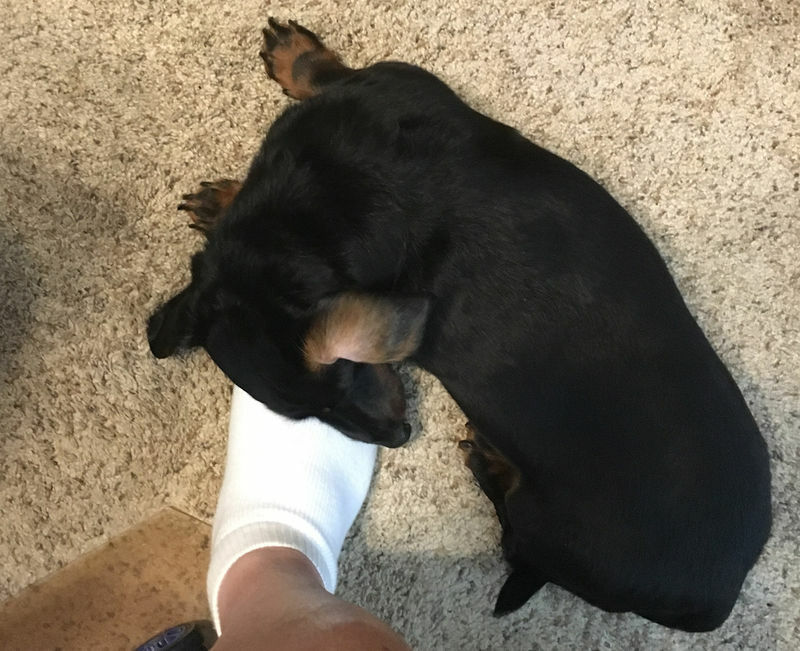 He had been the living room in a dog bed near my wife's feet. Yea, they have a tough life. 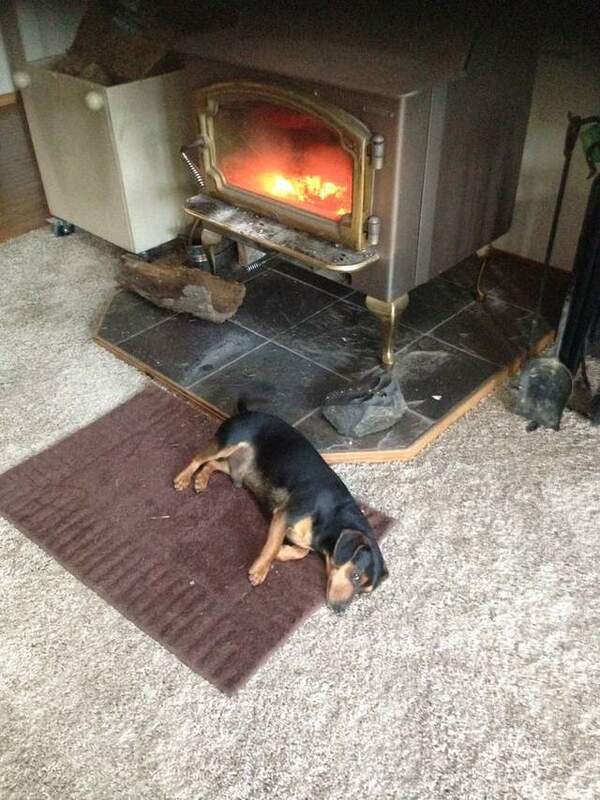 It is a good thing they are not spoiled. Dogs are kind of like sharks....they can sense vibrations of other living things moving about, and KNOW when it's feeding time ! We have 3 weiner dogs , two are 15 the other is 13 . The two 15 year olds can't see or hear very well and the 13 year old is partially paralyzed in the rear legs but can hear/see fine . Of the three the female ( 15 year old ) I swear can read the clock ! My wife normally feeds the pack and the female specifically can go from being in a coma on the couch to waking up and start barking for food ! We generally feed them around 5:00 AM and 4:00 PM and have basically since we have had them . The female will start her routine within 15 minutes plus/minus EVERY DAY of those times and has for the past 13 years we have had her........... like clockwork every day ! And she even seems to be able to adjust for daylight savings ......... I am not kidding ! We love/spoil our weinie dogs every day they bring so much joy to our lives . So you're not as sneaky as you once were ? ...and dawgs know stuff...I don't know how but they do and it's awesome! Dachshunds are motivated by food (I understand that's because they are a hunting dog). My first golden was NOT food motivated. From since I got her as a 7 week old puppy she would bring me her food dish when you could see the bottom. Not empty, just empty enough you could see the bottom. Fill it up and she would walk away happy (without eating any). Her motivation was to make me happy and/or get my approval. She was the smartest dog I've owned. My other two goldens are very food motivated. So much so they are difficult to train because they get so focused on the reward that is all they think about. As for senses...training my current golden to be a diabetic alert dog. They can tell by your scent what your blood sugar is. She has awoken me 3 times now in the middlle of the night when my sugar was getting low. A bit of a sixth sense going on with my dogs. They start gearing up with their misbehaving about three minutes before GF gets home. She's not always home at the same time but the dogs are usually right with their guessing. Location: Lake Cle Elum - Eastern WA. This guy ran away from my neighbor when he got a bird-dog in Feb.....Talk about spoiled: he's gone from 11 to 15 lb, and now sleeps with me. Last edited by Por_sha911; 09-05-2018 at 07:04 AM.. I am amazed at how easily Pit Bulls can sense that a human is food! Thanks, jerk. You've already posted the same news in another thread, so why ruin this one? I'm not sure how old you are but are you sure you weren't "squeaking" while you were walking? I took my dog to the Vet the other day, he has to go twice each year for a thyroid problem. He was all excited to go for a ride. When we got to the office I opened the door and let him out of the car. He took one look at the building, turned around and jumped back in the car. 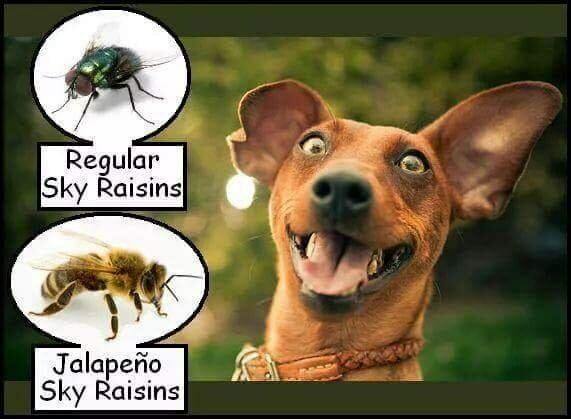 It amazes me how smart dogs really are. For senses, my dog can hear a thunderstorm coming long before it gets here, the poor guy is scared to death of thunderstorms. Last edited by cabmando; 09-05-2018 at 04:30 AM..
We had a great vet, old school kind of guy. Our dog just loved the him. Retired. Bummer for us, good for him. I don't have any joints that squeak, and I was was trying to walk quietly to test his senses. He was around the corner. I can guess my office chair might make some noise when I get out of it. For sure he has great hearing. He has chased off many packs of wolves, water buffalo, elephants, and a few prides of loins from the front yard. Or maybe that was a leaf. He has gotten much better about not barking at everything, but someone walking a dog for sure gets barked at. This is Reuben, he is 100% food driven, and a hunter. He has um, biologically captured and disposed of several mice, and uncounted bugs. He was really hungry the day the picture was taken. He did not want me to forget to feed him. This is Reuben on the left and Reese on the right. She is a long-haired dachshund. We got them from the same breeder. They raise the dogs with a lot of inside time and Reese is two years older. When Reuben was born, she would go to that litter and pick him out to play with. They are best friends. Both are "fixed" so no puppies. The pillow is big enough for a Great Dane, so two little dogs have lots of room. The cover was off for laundry day. These ladies are also supremely food-driven. They are fed daily at 5:00 sharp. They start campaigning each day about 4:30, sitting behind me in my office. Starts with sneezing fits, followed by soft whimpering, progressing to increasing levels of commotion until I relent and feed them. Once in a while, if we forget and leave the door to the pantry open, they feed themselves. We have come home before to find their bloated bodies lying on their sides, barely able to move. The next day is not pretty, as their little tummies are not happy when over-feeding occurs. As you can see, they lead a high-stress existence. Great thread and once again affirms why dogs are so much smarter than humans. They also exceed in other attributes, of course - perhaps another subject for another day. I remember reading that dogs have 3D hearing. They can tell how far a sound is and not just the direction. Java: please note my previous comment was removed. I apologize. It was out of place. Cats do the same..just can't train them to your needs. Ears are direction and distance locators. When they hear a mouse running through grass, they know exactly where it is. "Now, to put a water-cooled engine in the rear and to have a radiator in the front, that's not very intelligent."